5-JUL-2016: The number of servings left in a group meal is now displayed in the interaction name. 8-OCT-2014: Removed the seemingly unnecessary block EA put against teenagers and children from eating specifically single servings of Mac And Cheese, Autumn Salad and Waffles (seriously, if anyone can even come up with a plausible reason for why these 3 particular recipes are labelled as "adult only" in game do share). Thanks to iforgot for calling this to attention. 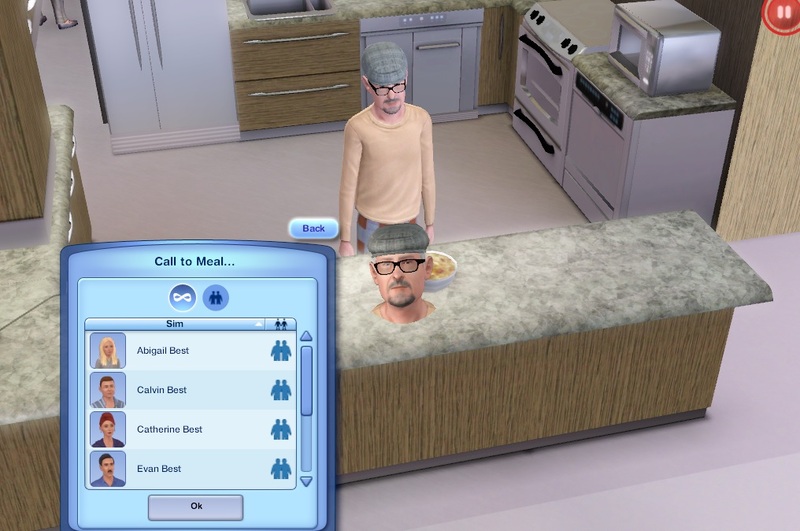 This a script mod that replaces the "Call To Meal" interaction on group servings with a custom version that has the performing sim set the table with individual portions of food BEFORE summoning sims to eat. Just click on any group serving of food and use the Call To Meal... interaction which now allows you to manually choose the sims you want to be dining. 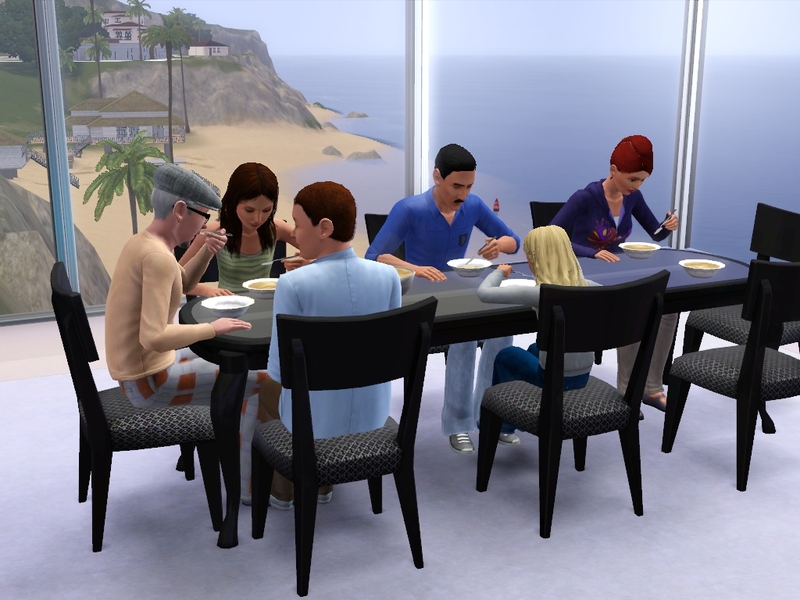 The sim will pick up the group serving, go to the closest table(s)/surface(s) best accommodating all the sims and automagically serve individual portions, one for each sim at the available seats at the surface. The selected sims will then come and dine at the table, each at their own individual spot, which is hopefully better than having them all swarm to the same group serving to grab a plate at once. The shortcut interactions to call the household/guests/every sim on the lot still remain, and they will now act like the interaction described above. If there are not enough servings left to feed everyone selected, hungrier sims should be prioritized by the interaction. When manually choosing sims you are limited to how many servings are left in the plate/bowl. Also remember to select the performing sim from the list as well if you want the sim to actually participate in the meal and not act as just a waiter. If there isn't a surface on the lot that can seat all the selected sims at once, the serving sim will attempt to find and serve the closest next best one (i.e. one that can seat most of the sims) before finding a different surface to seat the remaining sims, and should continue to do so until either all the sims have an allotted seat or there are no more suitable surfaces left on the lot (note that bars and bubble bars are completely ignored but island counters with stools can be considered). If there are servings left over the sim will just put the group serving down and the remaining sims (if any) will go to it to grab a serving like usual. I did mention "automagically" didn't I? The sim will route close enough to the table when serving it, but don't expect any fancy waiter-like animations since I wasn't sure how + was too lazy to implement that thought it best not to have the sim attempt to go that extra effort only to spectacularly route fail somewhere as I could imagine them doing. Interaction can be performed by sims aged child and above. Butlers should automatically be pushed to serve meals in this way after cooking a group meal. This is a script mod that will not conflict with any tuning mods. The original Call To Meal interaction is completely replaced with the custom one though so you won't be able to use that one even if you wanted to. Special mention to the people on the NRaas forum The mod was basically born from the suggestion to have Sims 2 style dining in the Sims 3, though honestly I've not played the Sims 2 long enough to know if this even comes close to whatever the dining experience then was. I do hope some of you will still find some use for it as it is anyhow.